Do you like to read to your kids? Would you love it if by reading to your kids, other children received books? Seriously...it's that simple! My friend Sherri (awesome mom to EJ's buddy Dario) recently turned me on to this great web site, We Give Books. Their tag-line is "Read A Book. Give A Book." and it truly is that simple. The site has an online library of children's books (not a vast amount, but new titles are added/rotated often). You choose a book, read it to your children and a book is donated to a child in need through the site. Over 90,000 books have been donated so far! I know it sounds too good to be true, but all the details can be found on the How It Works page. I know this site is going to be a hit in our family. The girls love sitting at my desk looking at my photo screensaver, so seeing books big on the screen will be great for them too. Jack was impressed that it actually looked like you were turning the page as you read. And I really like that the books are separated by age groups, so I can easily switch from a word book for Liv to a picture book with the big kids. And think about traveling with kids...instant books to read at bedtime! Please join us! Go here, sign up, and start reading! Anyone want to start a reading group with us? 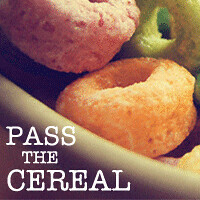 Join the Pass the Cereal Reading Group here. TOTALLY cool!!!!! can we do a virtual reading group? What an awesome idea! I realize my kids are older than the median age for this, but I'm hoping we can revisit some old faves anyhow! Love it, Heather! Thanks for posting, Heather! We'll be reading from the site tonight:-) Hugs and kisses to everyone from Dario.